This year the annual Frankfurt’s Musikmesse was held between the 11th and the 14th of April, 2018. In the words of the organiser, the “Musikmesse brings together companies with retailers, professionals from the musical-instrument sector and musicians from all over the world.” So, this definitely seemed like the place to be for a music start-up company like Musicinfo. It was a pleasant little taste of summer for us (Imre and Teemu) coming from wintry Finland: sunshine and 20+ degrees Celsius made sure we were going to enjoy our stay beneath the tall skyline of Frankfurt am Main. 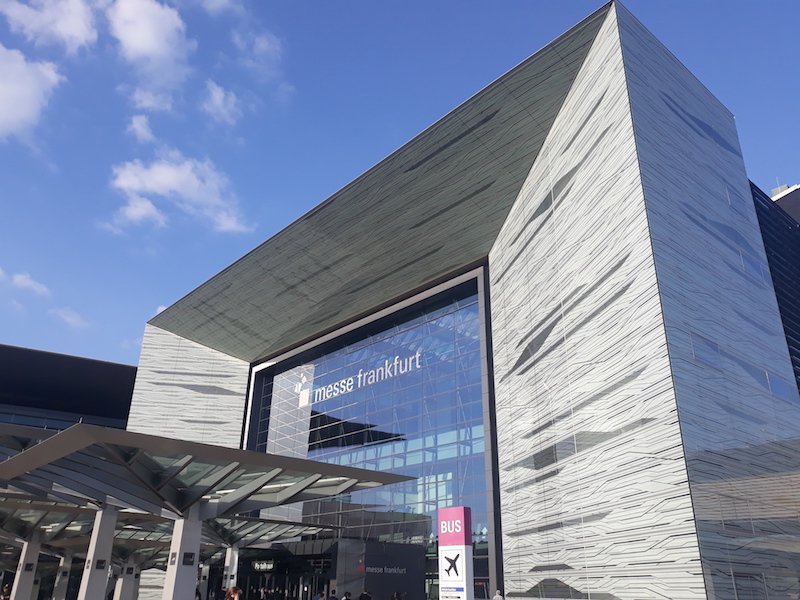 On the day of our arrival we checked out the festival venue, and the magnitude of this year’s Musikmesse became quickly clear: it was a near 15-minute walk from the main entry to our Hall 8.0 through airport-style moving walkways and escalators. This was going to be a super-busy and exciting fair no doubt. The rush at the main entry around 10 am was indeed unbelievable, it felt like we were attending a Bundesliga football match or a rock-concert. It was very exciting and inspiring to see so many huge fair halls full of exhibitors, interested guests swarming around the stands. We also got down to business immediately and started talking to interested people about our services at our stand. 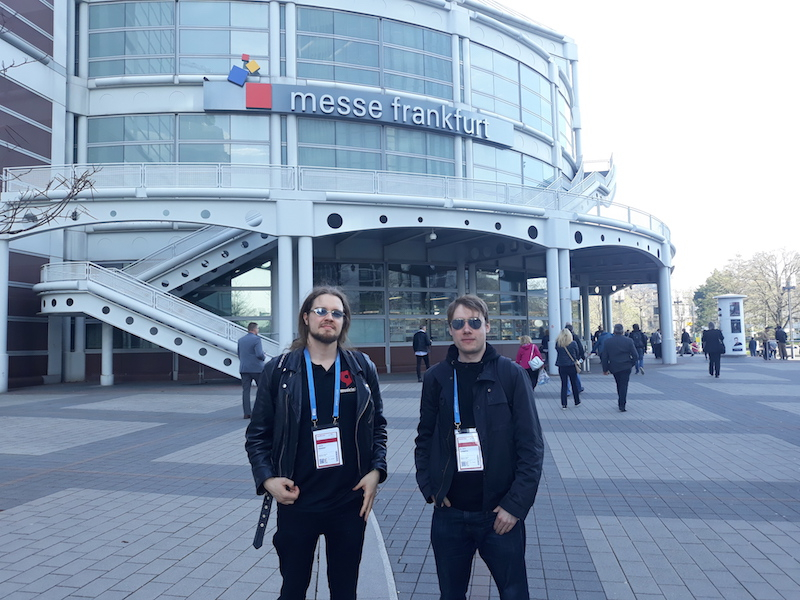 While Teemu already had experience from previous year’s Musikmesse, I was quite thrilled to meet so many people in one day and by the scale of the buzz. Right from the start people were very open and enthusiastic about our company and services, and surprisingly well aware of the fact that Western social media is not available in China for music distribution. In the afternoon we also had a look around the nearby halls and stopped for some additional networking along the way. We also popped over to Hall 9.0 and met with the only Finnish exhibitors besides us at the Musikmesse this year: the guys from Loota Percussion were showcasing two fantastic-sounding wooden drum sets to the interest of many bypassers. The second day was even busier than the first one. We met with a huge amount of people, and some even came specifically to meet us after having heard about our company through social media. We discussed business on both small and large scale: in addition to showing our distribution services to potential customers, we also networked with prospective new business partners and discussed possibilities for broadening our business model. The general atmosphere was very pleasant and positive, some people we talked with even wanted to take selfies with us – spirits were definitely high. On the third day we continued networking, and like on the previous day, we discussed business not only with bands and musicians, but also with company representatives. We also checked out the Musikmesse Guitar Camp, which was a special area in Hall 9.0 for mini gigs. We caught a stellar 30-minute gig by the unbelievable Mattias IA Eklundh: while Teemu was a huge fan already, Eklundh’s perfectly intonated 8-string guitar and complex Indian rhythms satisfied my appetite for musicological extravaganza as well. After the gig Teemu and Mattias were goofing around for a couple of photos, and I got Mattias’ guitar pick as a little souvenir of this year’s Musikmesse. We met also with small record label and studio owners, who were interested in distributing their artists’ music to China. Later we met with a couple of German rock-musicians, who kindly invited us to their radio show called VirusMusikRadio at the local radio station Radio x Frankfurt. We accepted the invitation with great pleasure and chatted on-air with our hosts about how to get Western music to the Chinese music market. By the end of the day we felt the physical strain of constantly standing and walking, but it did not matter as the work was most rewarding. The fourth and final day was an active one as well. We got pleasant feedback of our distribution platform: people thought it was clear and easy to use. Moreover, what really felt rewarding was that people also remarked that our service seems not only straightforward but honest in nature. That’s exactly what we strive for at Musicinfo: to win the confidence of our customers and to get across the message that we’re helping artists and record labels to spread their music to a whole new and huge audience in China. We continued networking until the very end of the final day – just before the fair officially ended we shared a couple of beers with the guys from Loota Percussion and called it a day. All in all, the Musikmesse 2018 was a very fruitful excursion for Musicinfo. It was an intense 4-day festival full of exciting and inspiring buzz, and an ideal place to promote and spread the word about our company and services. Practically everyone at the fair was involved with music in some way – from independent musicians to record-label owners and music business professionals. We were also very pleased how well the Musikmesse was organized, starting from the enrolling procedure: the officials were friendly and helpful, and the whole infrastructure of the fair worked perfectly. Danke sehr, Frankfurt!